Top / Repair service for SHARP LC-70C7450U power supply board causing totally dead TV, no standby or failing to start etc. Repair service for SHARP LC-70C7450U power supply board causing totally dead TV, no standby or failing to start etc. If your Sharp LC-70C7450U is either totally dead or its power supply board fails to activate and provide the necessary output voltage you may send the board for us to test and repair. Coppell TV Repair LLC offers a REPAIR SERVICE for power supply board RUNTKA935WJQZ based on DELTA DPS-162KP-1 (printed on the board) as shown on the picture and used in Sharp LC-70C7450U. To have us examine and possibly repair your board(s) you need to send them or bring them to us. Start the repair service request through the "Initiate service request" button on the page. Repeat customers are advised to log-in and new customers will have to fill-in a short form with contact information needed for communication and invoicing. An email with shipping instructions is automatically sent once you submit the form to the email address you provide; it is also shown on your screen. Following the instructions you package your board(s) and attach the first page of the shipping instructions so that we make a link between the boards and the service request when we receive your package. You then send the board to us. You pay for the shipping to a carrier of your choice and nothing to us at this point. Presently we do not charge in advance, but only after inspecting and possibly servicing the board(s) we receive. The price shown is for evaluation, repair, test and return within USA of the boards listed in the title or explicitly named in the listing, provided they meet our requirements upon arrival (see related section). Boards returned abroad tend to have higher shipping cost that will increase total cost of service beyond the amount shown. Once we receive the package and open it we inspect the board(s) sent. If the board(s) do not meet our criteria we communicate the problem with you and offer options, the first of them being returning the board(s) back for sole cost of return S&H. Other options may include surcharge for board restoration, board replacement, change of pricing or warranty terms etc. We may not give any options and simply reject to service a board that was damaged beyond repair (see example here). If the board(s) pass our criteria we conduct test to determine functionality. If test passes OK and board(s) appear in working order we communicate that and offer options, among which returning the board(s) without change; we invoice a testing fee and return S&H charge. We test all boards that are being sent and for every board we test we assess testing fee as described. Boards that test out bad are analyzed and we attempt to repair them. If we succeed we send a payment request for the amount specified in the listing. If we fail to repair the board(s) we send you an email with details and usually only request that you pay for the return shipping and nothing else. Please make sure your TV has the same board before proceeding with this service or contact us if yours is different to see if we offer repair service for it. TV showing standby power LED and (usually) responding to power on command by briefly changing front LED indication color before returning back to initial state. Depending on the power supply there may be audible click coming upon power on attempt and subsequent powering off and returning back to standby mode. TV taking a number of power on attempts until it finally manages to power on and stay on. This symptom tends to usually gets worse over time until a point comes where the TV simply fails to power on. Even though likely, neither of the above is 100% guaranteed to be caused by a failed power supply board. 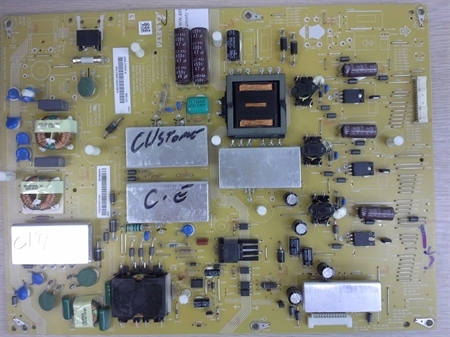 A TV may be completely dead if the standby portion of the main board is damaged and may shut down for a number of other reasons beyond faulty power supply. The list is also definitely not complete, i.e. there are a number of other ways in which a power supply could have failed resulting in a number of different symtoms. Finding a blown (open) fuse on the PSU or finding visually defective (usually burst and burned) components is a very solid indication of a power supply needing a repair. Finding swollen electrolytic capacitors is an indication of capacitors that need to be changed, but is not a guarantee that whatever problem your TV is experiencing is coming from those capacitors as they may be bulged and still functional for some time. Typical turnaround time is 2-3 business days. This is the time it takes for a package that was received to move up the queue and get opened. Once we open the package we usually have about 1 hour to get the case resolved or we will likely end up losing money on it. Sometimes, depending on situation, we may leave opened box and make another try on the next day. Note that it is not guaranteed that the queue will take exactly 2 or 3 days to process. Sometimes - especially after long holodays - it can be larger and take longer. We do our best, but we have no efficient means of managing the work load on demand. The board(s) we receive must be physically intact and must have not been tampered with or serviced before. The advertised flat rate for repair service is only valid when the above conditions are met. Exceptions are possible and often applied for minor repair attempts, but we reserve the sole right to judge if and when we would consider a repair minor. If we receive board(s) that fails the above conditions we will contact the sender and usually offer two options: 1) returning the board(s) for the sole cost of the return shipping; or 2) continuing the repair service at a higher cost in case of success. It is also possible, depending on the condition of the board, to eliminate the second possibility and just flat our reject having to service the board. Subject to situation and availability we may also recommend replacement of the board, again at the higher than advertised price for repair. In all cases you will have the option to receive your own board(s) back for the sole cost of the return shipping.